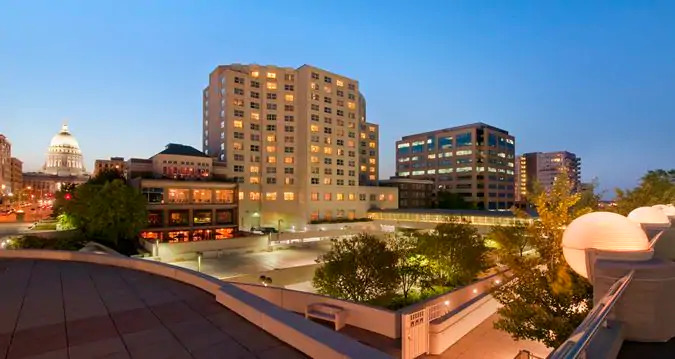 (10 minute walk to Monona Terrace) at a Group Rate of $179 – Complimentary internet for overnight guests and 50% off Self Parking and Complimentary airport shuttle to and from Dane County Regional Airport. or call to reserve your room at 1-800-356-8293. Please identify yourself as part of ASP 2019 Annual Meeting when making your guest room reservations. Reserve your room by June 20, 2019 to receive the discounted rate. We have a small block at the Hilton. It is attached to Monona Terrace with a group rate of $229. The Hilton Madison has complimentary shuttle service to and from Dane County Regional Airport. The hours of operation are 6:30am – 10pm, 7 days a week. Guests may request the shuttle upon arrival by using the courtesy phone located in baggage claim. Underground parking is available at the Hotel at posted ramp prices. Current rates are $18 for overnight guests subject to change. or call 414-935-5941 to reserve your room. Please indicate our group name: 2019 Annual Pharmacognosy Meeting and Group Code of: PHARM. Reserve your room by July 12, 2019 to receive the discounted rate. Hilton’s Cancellation Policy: 48-hr cancellation policy. Late cancels or “no shows” will be charged one night’s room and tax. No show reservations are released and are not automatically reinstated.